Fancy a festival style wedding? 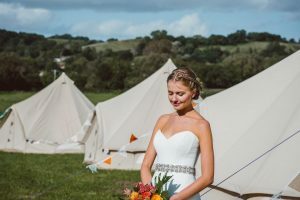 You and your guests can camp at Cott Farm… Our wedding venue camping option includes five luxury furnished bell tents, plus your guests are free to bring their own tents/campervans/caravans. We furnish our 5m luxury bell tents with a sumptuous king size bed and 1000 pocket sprung mattress, made up for your arrival with Egyptian cotton bedding. The tents are carpeted and include LED lighting.